The Cafe Don Pablo Subtle Earth brings out the best in coffee. It comes from the Marcala region, making it a dense and aromatic blend for most. It is available in light, medium-dark, and dark roast. You can use more if you want a denser flavour from the ground. This is a terrific product that should keep you happy for several months. The rich chocolatey taste can be made into low and acidity based on your choice. It is a pure, GMO-free Arabica organic coffee blend which has a medium dark roast. Forget about making bad batches with this exceptional choice! The Death Wish Whole Bean Coffee follows through with both taste and strength. The brand is well-known for its strong taste that lasts much longer and tastes much dense than conventional beans. This one is USDA-certified and Fair Trade-certified and is best used in small batches. You’d appreciate the kind of ground this product offers. The flavour is bold and effect is highly productive. It does what a good cup of organic coffee should do. And that is to keep your active, productive, and fresh all day. So, when you get up, as the brand suggests, you stay up! The Marley Coffee Organic Ethiopian Ground is a more affordable choice for most coffee lovers. It is an organic, Ethiopian ground blend; which offers the best of both worlds. If you’re sensitive to acidity, the smooth taste and kick of this ground keep you company for the best. The other more affordable brands that offer a weaker taste and too much acidity are tasteless in comparison to this one. You get a strong blend without the bitter taste aroma. It is medium-roasted with a fruity and aromatic undertone. Which is more than you can ask for at such a best price! This is the kind of caffeine produced and harvest without the use harmful substances such as additives, pesticides, and fertilizers. The actual meaning of “organic” is farm produced without the use of chemicals or toxins. This also means that products meet organic certifications for environmentally-conscious consumption. Farmers use organic substances such as compost, chicken manure, etc. for their produce. Using fertilizers this unconventional can drastically affect the way coffee is produced, in a good sense of course. Having said that, the Organic Trade Association, which is responsible for the production and consumption of coffee in different parts of the world, reported that imports of such unconventional beans has increased by almost 30% over the years. And due to its high demand, more and more brands are becoming environmental-conscious and following the methods of organic produce rather than that of conventional methods. In relevance of coffee, conventional produce has its shortcomings while organic produce doesn’t. The latter has plenty of nutritional benefits, alongside environmental and farmer benefits which we will discuss in the latter half of this guide. Choosing high-quality beans isn’t difficult if you’re a coffee lover. But it’s understand when you don’t know much about roasts and evaluating coffee labels. Here’s what we did to choosing the best organic coffee for you. Single out brands that tell you more about how they manufactured the beans and their origin. Low-quality brands are less likely to provide sufficient information to move forward with. This includes everything from the coffee’s organic processing to its transportation. An authentic label tells you from which particular farm, region, and state the beans come from. And whether there is any additional mixture with the beans apart from its original blend. The second most important step when evaluating the label is to check for its right “roasted on” date. This is essential because you need to know how fresh the beans are. For the best results in both taste and aroma, look beans that are roasted within a month of purchase. Science suggests that beans start reach their highest point in aroma and flavour within 10 days of roasting. Look for additional information on the production of beans such as its process, altitude, and region. This gives you a deeper understanding of the coffee you’re drinking, especially when it is organic. A high-quality brand will determine the right brewing temperature and other instructions for the best possible results. Is it certified? The best organic coffee brands are certified with either USDA or Rainforest Alliance certification. These certifications determine the trustworthiness in manufacturing and deliverance. It’s important for organic coffee drinkers to be aware of how environmentally-conscious and human-friendly the beans are. Avoid trusting on brands with many fancy labels. If the product is covered with misleading selling points to lure you into buying it, don’t buy it without careful consideration. Some labels also dictate the exact amount of caffeine in it. It generally illustrates how many grams of caffeine a packet contains or per serving. This is important for drinkers who prefer a certain type of brew strength for their beans. The average caffeine content in one cup should be 65 to 100 milligrams. However, if you want a stronger brew, it is higher than that amount, and lower if you want a milder brew. Similarly, you can also opt for blended roasts or single-blends if you wish to experiment with different tastes. However, the beans taste feels less brewed and original if you add milk or cream to it. Storing beans is important because it preserves its aroma, freshness, and taste. You should know whether freezing or storing your product in room temperature is right or not. Keeping beans airtight and away from moisture, heat, and water is essential. It’s important to keep the beans in a cool location and away from light. This is because coffee often loses its original taste after roasting, so preserving its freshness is very important. Contrary to popular beliefs, storing your grounded or beans in a freezer or a refrigerator is wrong. It affects the cell structure of the beans, making it stale and porous very quickly. Similarly, avoid storing them on decorative glass canisters. They may seem great and create a more aesthetic appeal in your kitchen, but that’s not the best way to store organic coffee. Beans pick up on moisture and strong odors easily, that is from other foods kept nearby. And refrigerating the beans or ground can deteriorate its freshness and antioxidant capacity in no time. Do you want to buy and grind your own beans? The process of making caffiene when you buy whole beans is more complicated as compared to buying grounded beans. You need time and extra equipment for processing whole beans at home. This is because ground beans hold a large surface area than ground, which makes brewing the former faster. But if you’re a coffee-nut, whole beans is your forte. And with whole beans, you can store the product for longer right up to 30 days, while ground beans last for 15 days. Whole beans are available in all stores, both online and physical. Your organic beans will last much longer and taste much better than ground beans. That is, if you know the correct way to grind them. To store whole beans, make sure you keep them in an airtight container or a sealed bag. Whole beans contain a lot of build-up carbon dioxide which must be released in smaller amounts over a matter of a few days. Regardless of whether you grind the beans on a daily basis, make sure to let the carbon dioxide out once a day for the first week or so. This helps when you roast and grind the beans yourself. It retains aroma, taste, and flavour without compromising on quality. The Cafe Don Pablo Subtle Earth is a unique yet aromatic product for true coffee lovers. If you want something that’s much less acidic in nature, feels smooth, and lasts for a long time, this is it. A single cup serving will keep you active and productive all day long. And while it’s eco-friendly, this kind of coffee is hard to duplicate on the market since it’s roasted in smaller batches for maximum taste. Most other brands will push you toward forced flavors. However, this pick uses the best of the best roasting methods to make your coffee as strong or as mild as you’d want it to be. This is pure organic gourmet coffee which a medium-dark roast and whole bean packaging. It works well all kinds of coffee makers and shares a deep, chocolatey flavour and aroma. If you want GMO-free and low acidity beans, go for this one. The flavour is dependable, effective, and the beans can be stored for longer. The longer shelf life is due to the caramelization of the beans. This locks in the natural sugar strength of each bean. The sugar, when it’s not artificially fed into the beans preserve the beans from decay. Want a flavour that offers the right coffee kick? 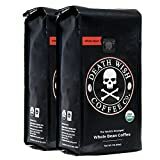 Try the Death Wish Whole Bean Coffee. It offers a stronger flavour which is smooth and less acidic in nature. Your advanced coffee machine needs delicious beans to serve you the best of the best cup each morning. And that’s precisely what the Death Wish wants to offer. After a first cups, your experience with this product will deepen. What this means is that the bold and smooth flavour will hit you as you learn how to brew the best coffee on the market. Despite its high price, this best pick is accessible as much as efficient. It has the effect of pure coffee without the acidity or stinging aroma. For being organic, it meets USDA, Fair Trade, and Kosher standards. Plus, it is processed in smaller batches to extract maximum taste and aroma from each and every bean. With its flavour strength, you can extract as much you want, which lasts longer than ground beans. It is even compatible with varied brewing methods such as French Press or even manual. For as long as you know what you’re doing is accurate and efficient. That’s how much this brand is best for your daily caffeine ritual. For a more traditional taste, go for the Marley Coffee Organic Ethiopian Ground. If you want a more affordable pick, or if our top pick is sold out, this is almost as good as a high-quality ground for a higher price. It is Ethiopian ground coffee with a fruity and winey flavour. For clean living, the Marley is an outstanding pick. The smoothness in both flavour and aroma are worth considering. And so is the mild roast coffee brew. This brand made a good comeback with its organically certified beans, which is a huge advantage for people looking to buy on a budget. And what’s even more appealing is the low-acidic, yet strong tones. You can pack this flavour in an espresso brew or even a best drip machine would work. Since it’s Ethiopian, you do not need to add sugar as it delivers a milk fruity taste. What makes this product the best of the best for its price is the USDA, Kosher, and Fair Trade-approved certifications. All you need to brew this coffee is 2tbsp of grounds in either cold or hot water. It seeps into the water like butter and makes a strong morning cup of Joe without any fuss. You like plant-based foods? Then you will love the Four Sigmatic Mushroom Coffee. 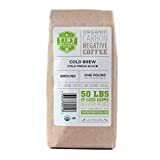 It is a vegan and paleo mix for coffee lovers. It’s good for making you feel fresh and productive. And it’s good for people struggling with acid reflux problems. This kind of organic coffee doesn’t provoke any pre-existing health problems. The taste is a bit earthy, made with mushrooms that are both energizing as much as mentally stimulating. You should definitely give this blend a try if you want something new and unconventional. These are grown in the highlands of Mexico and are carefully roasted and brewed. It contains no harmful toxins such as mycotoxins, which are studied to have an effect on the human nervous system. We like this mushroom because it has many nutritional benefits. It helps with inflammation, immunity, and our body’s nervous responses to fight against bacteria and stomach infections. And yes, it’s absolutely healthy for people with digestive problems. The best way to make the most of its flavour is to add a bit of peppermint for a refreshing and therapeutic flavour. It contains no wheat, additives, nuts, extra sugar, or cholesterol. It is the best organic coffee for vegans and those living a healthy lifestyle. The Cameron’s Specialty Coffee is an organic French roast of whole bean consistency. It’s one of the organic brands to go for when you want to start your day on the right note. The whole beans are of a good price, eco-conscious, and fresh. This French roast beats down all others of the same category. It contains lots of flavour and it’s a strong and bold to taste. If you think this contains more bitterness, you’re wrong! Every sip of coffee has an earthy, yet comforting taste. It doesn’t taste bitter at all, even if you do not slip in some cream or sugar or milk. The beans are dark and smooth to taste. And according to its style, doing a medium-roast is best for anyone who loves coffee. This organic coffee is 100% Arabica, hand-crafted and roasted in smaller batches for maximum flavour and freshness. It is certified organic and sustainable to bring you the smoothest flavour possible. This variety is also of a breakfast blend which means you can make as many cups of coffee as you like and still not feel sick of the rich taste. We like the Cameron’s Specialty for all it has to offer. As long as what you’re looking for is richness and freshness in flavour, get this one. 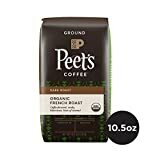 After spending a significant amount of time on researching the best organic coffee for our readers, the Peet’s Plant Organic Coffee People made its cut. This product offers a smooth, deep cup that will satisfy your morning taste-buds. This dark roast ground is USDA-certified and has a bittersweet taste with a hint of caramel to soothe your senses. It has the kind of taste that will please all coffee lovers. It has the deep-roasted taste without too much of acidity. And it’s one of the most reasonably-priced products we’ve found. A combination of quality, price, and convenience, this is the best organic coffee. When it comes to roasting beans, Peet’s is of a more intricate and smooth process than other brands. In their products, you will see just how much the brand cares about flavour, aroma, and roasting technique. The quality of the ground beans stirs a strong and pleasant taste. On the other hand, the ground smells like pure coffee. In fact, it is real beans as opposed to the kind of false claims many other organic companies make. In short, this is the kind of ground you need when you want a pure organic blend. It’s a deep, dark, and smooth blend, which is certified for 100% satisfaction. 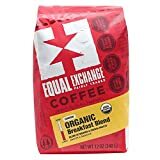 The Equal Exchange Breakfast Organic Coffee received a Fair Trade certification for its creamy and delicious flavour. It is packed in a 12-ounce bag with a medium-roast. The best part about this pick is that it’s organic and sourced from small-scale farmers to promote better businesses. You will also notice a slight hint of nut, caramel, and chocolate. From the start to finish, the beans are well-grounded, mellow, and the best kind of kosher beans you’ll find. This French roasted coffee is pure Arabica and fine ground. It is also the only reliable kosher beans in the lineup that’s Fair Trade certified. Which makes it a miracle worker in the organic world. If you know what’s good – go for the Equal Exchange Breakfast Blend. It’s reasonably-priced, smooth, and dependable. You can go through a lot of ground beans and still have get the taste as subtle and mellow as this one. Each batch is as consistent in flavour and aroma as the next. Which makes the brand more dependable for future purchase. On an ending note, the beans come from environmentally-conscious farms of Latin America. Offering a sweet and medium to dark-roasted blend for everyone. 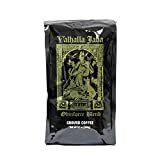 Here is incredible organic coffee in a striking and bold package, the Death Wish Coffee Valhalla Java offers USDA-certified and Fair Trade supported grounded beans. The beans are deeply-roasted and extra-strong, without the excess acidity to go with it. Which means these are specialty-grade beans that offers a smooth and bold flavour. Some call this a “high octane coffee” brand for its lively blend that’s 100% organic to start with. You can a nutty and chocolatey flavour which is good to wake up to every morning. We highly recommend this pick to people who want a deeper and darker roast. It offers a pure coffee rush which is difficult to resist. You can drink it black or with a portion of milk or cream. For those of you who don’t themselves coffee experts, this might make you a good judge of one. The rich aroma, deep flavour, and smooth texture provides the right caffeine rush. Not less or not more that was it’s supposed to do. The aroma, during and after brewing, promises a tantalizing experience. And each time you put up a pot, you’d be thanking yourself for buying it. It’s true that you’ll more than you have to for a blend this consistent and beautiful. The Tiny Footprint Coffee Organic is good for cold brew coffee. It contains both light and dark roasts. Brought to you from Ecuador’s cloud forests, this organic blend offers floral and smooth taste. For one, you have great tasting beans without harming the environment. It has a long shelf life, is easy to brew, and you can add cream or milk to it. If you have a sensitive stomach, the texture and blend of this product will keep you satisfied. During brew, none of the grounds seep through the filter, which is a common complaint for ground coffee. For someone who enjoys a smooth and mellow texture, making this in a cold press machine is perfectly good. This product also works with a French Press. If you a stronger concentrate, you can opt for seeping the grounds overnight. It offers a good, non-acidic taste which lasts for a long time. Similarly, this is a negative carbon brand which promotes healthier production of organic beans without leaving a footprint. So the more you purchase this organic, the better it tries to save the environment. On an ending note, it has a medium-dark roast blend which is good unique blend of light and dark roasts. The Organic Coffee Rainforest Blend has great reviews for many reasons. For starters, it has crowd-pleasing flavour which is both smooth and mellow. It offers a perfectly-balanced blend, medium-bodied, and harvested without the use of chemicals or heavy toxins. The Rainforest Blend is USDA-certified and is a responsible Fair Traded company. Which means it’s eco-friendly and labor-conscious. The flavour comes with a hint of almond, which is both unique and comforting. You can go through about a few batches, and the flavour holds up. In the first sip itself, the almond and smooth flavour of medium-roasted beans will smell divine throughout the house. It’s that strong and effective. We like this pick for what it is. And that is for brewing a subtle cup without the acidity which might upset people with digestive problems. The amount of caffeine in each serving is not more than it should be. You can brew it overnight, as black, and with or without cream or milk. And it will still taste incredible and well-balanced. So how can you tell if an organic brand is certified organic or not? Our research suggests to look for certifications such as USDA or Fair Trader for accurate feedback. And that’s what we did to look for the best of the best brands for you. Looking for a brand that’s honest, reliable, and efficient is difficult when you don’t know where to look. But with the help of this guide, you can do more than just hunt for the best pick and be done with it. You can read more about the manufacturing of organic and conventional coffee and its effect on the environment. You can also understand the difference between them so you’re more comfortable with your decision of switching to healthy foods. At the end of the day, all our readers want something that’s great for most people. It is healthy, certified, delicious, and has a longer shelf life. So, our top picks prove that such a purchase is possible. If you grind beans at home, or prefer ground beans for your machine, we have the best pick that suits all your needs. As far as food is concerned, organic living is a tough choice to make unless you have many options to choose from. We’re happy to say that we found the best brands for you at a comfortable price. Q. What’s the difference between non-organic and organic coffee? A. Did you know non-organic coffee tastes the way it does because of harsh chemical processing? Research proves that beans is one of the most chemically-processed crops on the market. Almost every acre of beans crops gets treated with agricultural chemicals, not less than 20 pounds per acre. Conventional, or non-organic, beans contain high toxins and some of them still remain after roasting. This is good enough reason to make the switch to healthy, organic coffee. To better understand the difference, you should know about the different ways beans is processed. These methods use various chemicals, toxins, molds, and other elements to process coffee for consumption. The first method of harvesting fresh beans is called “cherry.” This method is the primary step of beans production because it makes raw coffee into beans that are fit for roasting and brewing. The picking of the coffee cherries takes careful consideration and effort. Only high-quality cherries are harvested while the remaining are deemed unfit. Unripe cherries taste bitter as compared to ripe cherries which offer a tastier and rich aroma. Most manufacturers invest exorbitant rates into finding and harvesting the best ripe cherries. Hence, the price of beans sold on the market also increases. After the selection and distribution of the cherries, the process of fermentation extracts residue substances surrounding the beans. After which each cherry is dried to fight off the accumulation of any mold. Beans that are dry-processed are prone to house a potentially harmful chemical known as ochratoxin. This arises due to the production of mytotoxins on the beans. This causes degeneration and depletion of neuron cells in humans. Hence, dry-processing beans is often avoided by manufacturers. Wet-processing the beans, on the other hand, is the least toxic-driven processing to rely on. For example, the composition of a single bean, after processing, contains various sugars and amino acids. Such biochemical alterations in beans can influence the reproductive capacity of it. This results in higher amount of chemical concentrates and toxins. But this is in lower amounts because of wet-processing than it is in dry-processing. Wet-processing involves the removal of mucilage from the surface of the beans through fermentation or manually. The latter method is the most traditional as it uses less water; which results in less chemical contamination of the beans. Organic beans produce is farm-only without the use of any pesticides or synthetic fertilizers. And as per organic farming standards, a company is made certified as an organic brand only after 3 years of unconventional farming that meets standard requirements. The difference between conventional and organic coffee can be understood in its production methods. Q. What are the health benefits of drinking organic coffee? A. The organic beans you drink before work every morning – it has more health benefits than you think. On a farming scale, farmers who produce unconventional caffeine earn more income than conventional produce. This is because they are a part of a fair trade complaint which allows them to earn more and while producing certified organic coffee. The reduced use of fertilizers, fungicides, and other chemicals cuts back on production cost for farmers. This promises quality assurance for certified companies responsible for producing unconventional beans. This concludes the greater antioxidant and environmentally-friendly value of organic beans on the market. Q. How do I know whether my coffee is organic? A. A lot of caffeine brands claim they deliver 100% organic and chemical-free beans, but not all are credible. You shouldn’t take brands at face-value. What you should do is read the following organic coffee certifications to emphasize on its environmental and biological benefits. This alliance is responsible for sustainable agriculture processing, including coffee. It’s not only an environmental alliance, but promotes the better treatment and coordination of its workers. Brands with certification offer a better price of beans and ensure better production value. This is considered as the benchmark program for all organic beans certification. All beans sold must be certified with USDA. Including conventional beans as it promotes better and conscious use of fertilizers and herbicides. This isn’t a stand-alone certification to rely on, but it does hold ecological and environmental value for production. All brands with this label meet international standards, and some of which are also certified organic. This is the dominant organic certification for the world. Ecologists behind this campaign strategize earth-friendly and bird-friendly production and consumption of caffeine. The Cafe Don Pablo Subtle Earth is the best organic coffee for GMO-free and pure Arabica taste. If you have a more particular taste in coffee, this makes for an aromatic and denser blend. You can brew it from light to medium-dark to dark roast. And it has the kind of packaging that should last you for a long time. In terms of flavour it’s rich and chocolatey, which makes it even more palatable and effective. This best of the best pick is filled with both flavour and aroma that should keep you from buying any other brand. It is truly intended to keep your taste buds happy and intensified whenever you feel drinking a cup of Joe. Now, this may be a morning, evening, or nightly ritual.